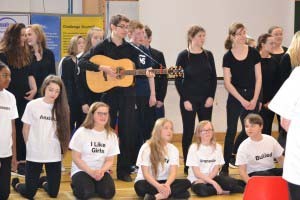 Salus sadly comes to an end at the end of March 2015 and to mark the project’s many wonderful achievements we hosted a Final Salus event, on Friday 27th February at Erne Integrated College, Enniskillen, Co Fermanagh. The Salus Project has been held up as “an exemplar mental health awareness training model for young people, front line staff, Teachers Parents & Carers” by an independent evaluation. These were some of the highlights shared at event . Salus (meaning wellbeing in Latin) began delivering in post primary schools across Fermanagh, Derry, Donegal and Cavan in September 2013. 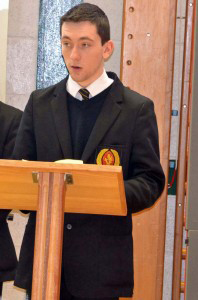 This vital project, received over £300,000 from the European Union INTERREG IVA Programme, and was delivered as a joint initiative between Action Mental Health and the National Learning Network, providing pupils, teachers, parents, carers and youth facilitators with vital mental health awareness training. 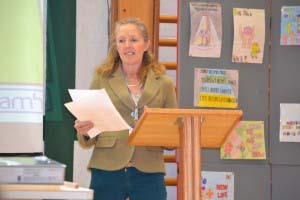 Pauline Flanagan, Manager of the Salus project, informed an audience of invited guests including local MLAs, Councillors and key people from the Education and Health sectors North and South, that 6,700 young people aged 11 to 25 years and the adults in their lives had received Mental Health Resilience training in the form of ‘Provoking Thought’ workshops. These sessions help recognise the signs and symptoms of mental ill-health as well as providing advice on how to look after your mental wellbeing and where to seek help if you need it. Other bespoke workshops were delivered on topics such as Bullying & Peer Pressure, Confidence & Self-esteem, Self-harm & Suicide Prevention, Stress & Exam Stress – all from the suite of programmes designed by Action Mental Health. Celebrating the success of the project, key note speakers included the charity’s CEO, David Babington and David Muldoon, Head of Accreditation, Standards & Supports at the National Learning Network, Dr Cody, a Consultant Psychiatrist in the Western Health and Social Care Trust and Chair of Royal College of Psychiatrist in Northern Ireland. They jointly called on policy makers to endorse this model which has been independently evaluated and to place Mental Health awareness training as a compulsory subject on the school curriculum. 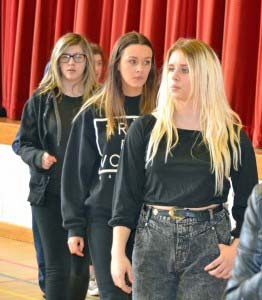 A drama production ‘Sound of Silence’ was performed by young people from across the four counties under the guidance of Brenda Burns, Drama Facilitator. This was one of many mental health promotion activities carried to endorse the Public Health Agency’s campaign “5 Ways to Wellbeing” on how to look after you mental health. The production was recorded professionally and will be available for future resilience training presentations, run by Action Mental Health, as a legacy of the Salus project.